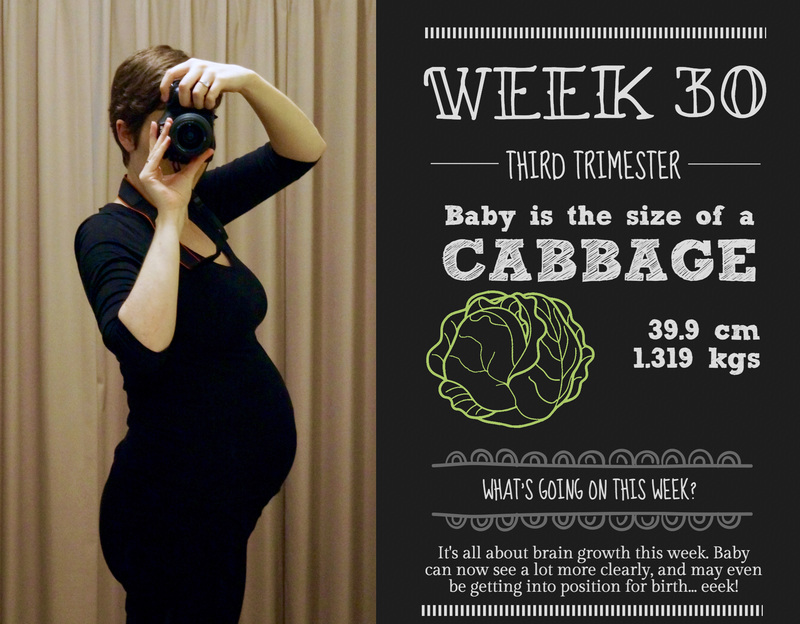 Baby: A cabbage – ewww. Stinky baby this week, only ever redeemable covered in mayonnaise, coleslaw style, which of course I can’t eat. What I’m cooking: A brainy baby, who’s also apparently looking around, and potentially getting in place for birth! Every scan I’ve had she’s been head down, bum up, which I guess is a good thing – I just hope she stays that way…hearing the issues with breech babies doesn’t fill me with glee! Main symptom: My ribs have subsided slightly this week, thankfully, but hayfever has taken its place as the part of my body that’s falling apart. I’m able to take a nasal spray for relief, which has helped a great deal, but my eyes have developed into balls of itchy dryness, causing me to come very close to scratching them out. I’m really hoping I can get a handle on them soon, because I’m becoming insufferable with all of my whinging. What’s on this week: The beginning of the 30s! Hopefully, the 30s in pregnancy are similar to the 30s in real life – I’ve been enjoying my thirtieth year so far! We also have another prenatal class, this time to scope out the labour ward…eeek! Well, I’m definitely in the third trimester. I don’t seem to have a day go by without developing a symptom that makes me hate the world and moan to all and sundry. I ended up seeing the doctor about my sore rib, and he diagnosed me with costochondritis – an inflammation of the cartilage in the rib, which is causing the near constant pain. Of course, the best treatment is an anti-inflammatory, which I can’t take, so the next best thing is some strong painkillers, thankfully safe to take in pregnancy. He also confirmed that the best solution for my hayfever was a nasal spray (the exact one I’d picked up from the pharmacist), so I am now carrying a whole drug store worth of medication in the hope I’ll feel normal soon. On top of that, this week I’ve developed the dryest, itchiest eyes I’ve ever experienced. I’ve tried creams, sleep, showers, eye baths, everything natural I could think of to help, but I still nearly rub off the front of my eyes on a daily basis. I was back to the chemist today for relief, and the only thing I’m allowed to have are dry-eye eye-drops, not really dealing with the fact I’m pretty certain that this is hayfever related. However, it’s better than nothing. A drop in each eye every hour is making me far less murderous than I was. I seem to be breaking apart at the seams at the moment, and I’m mainly putting this down to the fact that I’m running on empty. Being a teacher, I normally hit my limit by the end of each term, and spend the first few days of the term break in bed with the flu I’d been holding off. This time, everything’s multiplied as my stamina is not what it was, my immune system is much lower, and there’s a lot more going on with my body. Bring on the bloody holidays! Thank goodness they start this weekend. Turning to something more positive, we had our second prenatal class this week, and while the discussion on birth complications (including the one I could barely bring myself to listen to – infant loss) was not my favourite, the tour of the labour ward was quite enlightening. It’s funny, I don’t know what I expected, but it seemed very clinical. I mean, obviously, right? It’s a hospital. But I somehow thought it would look more comfortable. It was very much a standard hospital room, although it was quite big, and had a storage cabinet full of birthing accoutrements – birth balls, mats, supports etc. There was also an ensuite, with only a shower. There is a bath available (quite a few actually), but they’re not specifically attached to the rooms, so it’s a matter of demand as to whether you get access. I made sure Mr Nester knew that I definitely wanted a bath once I got to the hospital – I’ve heard great things about the pain relief of being submerged in water, and baths have been my relaxation of choice for pretty much the entire pregnancy. What else? We’re pretty much on the countdown now, last week of term, first week of the 30s, 10 weeks until the baby! We also picked up a change table on the weekend (another eBay buy – beautiful solid timber change table for $60! ), so the nursery is starting to look close to finished. Oooh, one more thing as a money saver – we bought an app that acts as a baby monitor. Basically, you need an old iPhone or iPod to act as the actual monitor, then you log in as a parent on your own phone, or possibly also the iPad. It’s amazing. You can adjust the night light view to see when it’s pitch black in the room, hear them if they cry, you can talk to the baby through an intercom button, and you can play them music and white noise (both included). All for $6. Much cheaper than the hundreds of dollars for the standalone version! We’ve tried it out at home and it works perfectly. The best part is, both Mr Nester and I can log in at the same time, so we can use either phone, or see how they’re doing if one of us is out. If you’re interested, it’s called Cloud Baby Monitor, and you can find it here. That’s it from me, I’ll be on holidays next week so expect a much more chilled out post! P.S. I never heard back from the hospital regarding my glucose tolerance test, so it looks like I’m in the clear! Hurray for no gestational diabetes! Great @not having GD!! I failed mine .The only thing I crave for is muffin and I could not even get a bite of it!! It’s terrible .. & 7 more weeks for you to be full term!! yayy!